Thailand is one of the most popular tourist destinations around the world, and for a good reason. It is a country for adventurers and culture enthusiasts. It is a country for party animals, and also for those who want to meditate. No matter what kind of traveler you are, Thailand has something special waiting for you! All you have to do is find out what is the best time to visit Thailand, and you’re good to go! Here are the facts, so you can make the right decision! The best time to visit Thailand is between November - March, when the weather is cool and dry, following the monsoons. September - October is also a good time to visit the northern part of Thailand (like Chiang Mai), or the gulf coast (islands like Ko Samui). The months of September and October are not ideal to travel to Phuket or Bangkok, as these areas will experience a lot of rainfall, which might interfere with your beach plans. April to May is a good time to travel to the coastal areas like Krabi, as well as Bangkok and Phuket. Thailand is an endless adventure. You can party the night away in Bangkok, or go scuba diving in the west coast. You can enjoy the finest five course meal in a fancy restaurant, or have local seafood in a shack near your hotel on a beach - you can be assured that it will still taste delicious! Thailand offers an endless amount of adventure for those who seek to explore its labyrinth. You just have to find out when you should visit! The best time to visit Thailand is between November and March, which is the winter season. The monsoons are over, leaving the country lush and green, with an incredibly pleasant weather. This is the best season, and the high season to travel in Thailand. If you travel during this period, you will be able to visit all parts of the country with ease. Besides this, Thailand has two shoulder seasons. April - May is when to visit Thailand if you want to stick to the coastal areas and the beaches, as the warm summer climate will be bearable in these regions. September - October is another shoulder season, and during this time, the weather is ideal in the gulf coast and in the north. The shoulder seasons see much less tourist footfall, so that is a definite plus point as well! After the monsoon season, the sun returns to the country during these months. The weather in Thailand becomes dry and warm, making this the ideal season for some beach fun. There is little rain throughout the season (most of the rainfall happens in November). This is the high season, so there will be a lot of tourists around, especially during Christmas time. It is highly recommended that you book your tickets well in advance, as there will be a sharp rise due to the high season. Highlights: This is when to visit Thailand for some premium beach fun. Head over to Krabi, Khao Lak, Ko Samui, and Phuket, where you can enjoy the warm waters, and the crisp breeze. If you travel towards the beginning or end of the season, you can escape the tourist crowd as well. There are a couple of festivals for you to enjoy during this season as well, including Loy Krathong, a local Thai festival celebrated in November; the Chinese New Year celebrated in January/February; and the one of a kind Chiang Mai flower festival in February. The weather in Thailand in these months is pleasant, but it slowly starts to heat up. The summer heat begins to rise, especially towards end of April, and it will be quite hot inland. Towards the coastal regions, the ocean breeze will keep the climate in check. This is the shoulder season following a peak season, so you will be able to get good discounts, and enjoy the country bereft of tourists. Highlights: This is the best time for you to head to popular tourist destinations like Bangkok, Chiang Mai, Phuket, etc. as the crowds would have reduced, thereby making the stay and tickets cheaper. The dry weather makes this the ideal time to explore Ayutthaya, the Khmer ruins, etc. as you will be able to walk without having to worry about the rains! If you’re in Thailand during this period, you can enjoy the beautiful New Year’s celebrations from 13th to 5th April, also known as Songkran. This is the low season in Thailand, as the incessant rains drives tourists away. The summer temperatures wane, and the rainfall starts to increase. August experiences the heaviest rainfall of the year, especially in the Golden Triangle, and Chiang Mai. There will be lots of rainfall in the islands and the southern beaches as well. This is a low season, so you can enjoy good discounts on accommodation and travel prices. 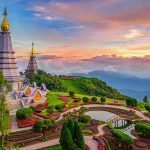 Highlights: This is the best time to visit Thailand, if you know which parts of the country to visit. The east coast beaches (like Koh Samui, Khanom) will be dry during this season, and enjoy a lot of sunshine, so you can head to these beaches, and enjoy a much cheaper vacation. You can even go diving at Koh Tao - and this is the high season for that! You can also explore the less known parts of Hua Hin, Cha Am, etc. September and October are still wet months, but in different parts of the country. Now, the monsoons shift to the east, making Koh - Samui and the south-east coast rather wet. Phuket, Krabi, etc. also experience a lot of rainfall during this period. This season is much better in North and the gulf coast - so if you want to head to Chiang Mai, now is the time! Highlights: This is when to visit Thailand for vegetarians - as the 9 day long Vegetarian Festival in Phuket takes place in October! This is also a wonderful time to visit Khao Sok National Park, where there will be a lot of rain, but the entire area will look lush and green, giving you a splendid view. Wildlife enthusiasts will have a greater chance of spotting wildlife during this period as well! Thailand is one of the world’s most popular..